Sunday Funny: McDonald's Korea - "Fry Thief"
Sunday Funny: McDonald's - "Baby"
News: Burger King Testing Country Pork Sandwich? Sunday Funny: From Burger King - Eat Like Snake! As I've written before, Subway's Orchard Chicken Salad Sub features chunks of chicken, celery, red apples, golden raisins, cranberries, a light creamy mayo and your choice of veggies, on Subway's fresh-baked bread. As a bonus, the Orchard Chicken Salad Sub is part of the $5 Footlong Value menu as well as a part of the Subway Fresh Fit Menu if you only eat half of the foot-long. On a footlong, you get about four small ice cream scoops worth of chicken salad, which is then spread out on the bread. Since I was keeping it healthy, I got the Orchard Chicken Salad sub with no cheese, no sauces, and a buttload of veggies; so much that my "sandwich artist" had problems keeping all the veggies in as she tried to wrap the sub. I didn't go healthy with the bread though, settling for the regular Italian roll. While I could taste apples, raisins, and cranberries in the chicken salad overall as a flavor, I didn't really feel them in my mouth texturally; they were pretty soggy and missing the expected crunch or juicy bite, suggesting that they had been sitting in the salad for a while. It's not really a surprise at Subway since everything seems to come in containers and nothing seems to be cooked or prepared in house. On the plus side, for those who don't really like the taste or texture of fresh celery, it's very muted; I could hardly taste it at all. Then again, if you like celery, this might not be what you're looking for. 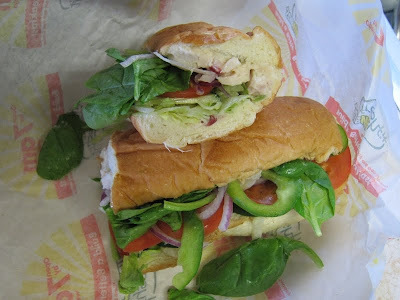 All in all, Subway's Orchard Chicken Salad Sub was pretty good. Even awash, as I requested, in a sea of spinach, lettuce, tomatoes, red onions, and green bell peppers, you could taste the tartness from the fruits and mayo and the flavor of the chicken. It complements the vegetables very well without being too strong. Better than getting a fast food salad in my book. @Anon: that is for the 6-inch sandwich including the salad and bread. I just ordered a foot long to share with a co-worker and was extremely disappointed when I only got two scoops of chicken salad. It was spread so thin that I could taste it at all. When I questioned it two-scoops was all I was supposed to get, I got a quick positive reply and a shrug of the shoulders. Very disappointing. Wow... two scoops is barely anything, you might get a piece of chicken one of every two bites... I think you'd have to get at least 8 scoops to have it look like it does in the promo picture. complaints about serving scoop have to do with your location not the sandwich... i have eaten it several times and it has been well filled with chicken salad and toppings. Just had this today and had them make it into a salad with no bread. They were plenty generous with the scoop. No bread but full anyway!! I like the orchard sub.If you can find the subways that are always busy the fresher the salad and breads. The WORST chicken salad I have ever had. Come on Subway you can do better than this. Had this sandwich today and only got 2 scoops on the foot long -- not enough but what I got was very good. the new chickem orchard chicken salad was alful i agree with the other writter come on subway you can do better then this i also think it should be pulled off the list. its look way better than it taste. i got it today and it tasted like dog poop. like cmon subway this is not your best sub. Got one today and the fruits are soggy and the chicken is froze.....flavor is almost non existent. Was hoping it would be as good as the "lobster" from quizno's, but this was a disappointment...I am not ordering again. I was disappointed to hear that the orchard chicken salad sub was just a limited time special. I absolutly love it, and wish it was a regular subway item. I have freinds that are as disappointed as I that its no longer on the menu. By all means please bring it back.
" 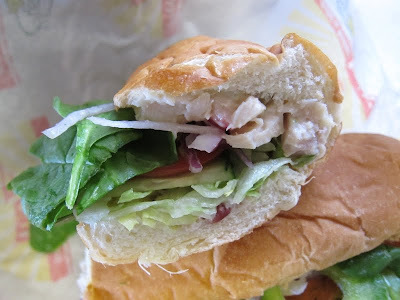 Missing my sub "
I am in love with Wendy's apple pecan chicken salad with Avocado Ranch dressing. It's pricey but wonderful! Normally I LOVE this sub however for the 2nd time this week, after working out, I tried a different Subway that is outside of my fitness center. Both days the sandwiches were not the normal taste. After close examination I found it to be very heavy on the mayo (which did not taste very good), lots of chicken, & soft apples. Could find nothing else in the chicken salad that was supposed to be in it. If you tried it & did not like it I would suggest trying it at another location. I will not buy it here again & will report it to Subway corporate as it was VERY SUBSTANDARD! I can't wait for this to come back it is so good. Then again I worked there and i was the one preparing the food. When the orchard chicken salad came out they sent a special scoop which is much larger than a normal ice cream scoop and it's supposed to be two even scoops, you get in trouble for having them rounded. The tuna and normal chicken salad is 4 normal ice cream scoops. It is prepared in house but the whole package is frozen, unthawed when needed and all of the contents are then mixed together with very little light mayo. But, yes, if they leave it in the fridge for a few days before mixing it the stuff does get soggy. I always mixed it when it was still slightly frozen and it came out best that way. They only keeps it two days after mixing. But then again I live in a small town in Maine and our locally owned subway franchise is very particular about how the food is made, kept, and served.